When your painstakingly manicured lawn develops circles or semicircles of deep green grass that grows as if it were on steroids, or sprouts rings of puffballs or mushrooms overnight, fairy ring fungi are at work. Dead, brown arcs accompany the rampant grass or mushrooms mean the fungi are making changes to your soil. While eradicating them isn't possible, minimizing their effects on your lawn certainly is. Fairy ring fungi are most active during warm, dry summer and fall weather. In mild-winter climates, they may blemish lawns from early spring to early fall if rain is limited. Mushrooms and puffball fairy rings often emerge when heavy rainfall ends prolonged drought. Science has yet to determine when one of the rings will appear, and a lawn afflicted with them one year may be free of them the next. 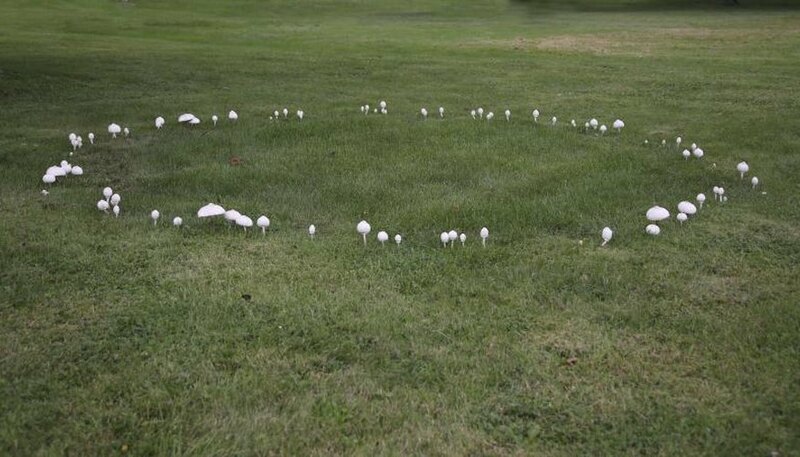 Although they may ruin your lawn's appearance, fairy ring fungi don't attack the grass. Some species live in the thatch -- the layer of new shoots, dead grass and roots just above the soil. Others live in the soil itself. Those with puffballs or mushrooms spread by spores, but all of them also spread through underground growths called mycelia. Mycelia convert the soil's organic matter into ammonia, a source of nitrogen that acts as a fertilizer, causing those lush, deep green rings. Soil encased in dense mycelial mats repels water, and the overhead grass dies of thirst. In the worst cases, the fungi release hydrogen cyanide deadly to a lawn's roots. Fairy ring fungi are territorial organisms, staking claims on their patches of turf by releasing fungus-inhibiting metabolic compounds. These compounds stop encroaching fungi of the same or different species, but they also limit the spread of their originators. This less-than-neighborly behavior explains why the lower ends of fairy rings growing on sloping terrain remain open. As the metabolites move downhill, the soil in their wake becomes hostile to all the fungi, including the one that released them. Preventing fairy ring fungi from inhabiting your lawn or soil is impossible, but limiting their outbreaks isn't. Use a sharp-tined dethatching rake to clear thatch from your lawn whenever the layer reaches 1/2 inch thick. This eliminates many of the above-ground fungi. Breaking up the mycelia with a lawn aerator each week prevents dead areas by allowing water to reach the roots. Rake up mushroom or puffball rings as soon as they emerge, so they don't release spores. Wear gloves when handling the mushrooms, and dispose of them in sealed bags where children or pets won't find them. Many fairy ring mushrooms are poisonous when eaten. To camouflage fairy rings of dark grass, trim them to the same height as the surrounding lawn. Then feed the entire area with a high-nitrogen fertilizer, such as a 30-3-3 formula to darken the surrounding grass, water it deeply and keep it moist but not saturated. Apply the fertilizer with a spreader set to provide 1.6 to 6.4 ounces of nitrogen, or the label's recommended amount, per 100 square feet of lawn. Don't fertilize during drought or when the lawn is wet.